As Archbishop Joseph W. Tobin headed to Rome to be installed as a cardinal by Pope Francis on Nov. 19, his thoughts naturally returned to the first time he met the pope. The year was 2005, and the two men were part of a meeting of the Synod of Bishops. For the better part of four weeks, they sat next to each other, talking about the topics of the meeting and getting to know each other through their shared ability to speak Spanish. At the time, Cardinal Tobin was the superior general of the Redemptorist order while Pope Francis was Cardinal Jorge Mario Bergoglio, the archbishop of Buenos Aires. The synod took place shortly after the conclave of 2005 that elected Benedict XVI as pope—a conclave in which many observers noted that Cardinal Bergoglio likely finished in second place. From that moment on, whenever their paths have crossed, Pope Francis has always asked Cardinal Tobin about his mother, Marie. 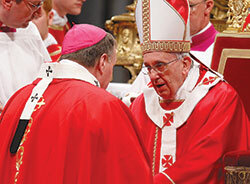 The bond between the two men was especially evident when Archbishop Tobin knelt before Pope Francis in St. Peter’s Basilica on June 29, 2013, to receive his pallium—a circular band made from lamb’s wool that symbolizes his role as the shepherd of the archdiocese and his communion with the pope. That conversation still touches Cardinal Tobin. Three months before Pope Francis made that announcement—“on a steamy afternoon at the end of July”—Cardinal Tobin visited the pope in the guest house in Vatican City where he lives, to discuss Church business. Cardinal Tobin shared some of the details of that meeting during a homily he gave at SS. Peter and Paul Cathedral in Indianapolis on Sept. 7. “I didn’t even have time to put on my game face when I arrived at his floor. The elevator opened, and there he was,” Cardinal Tobin began. It’s one more bond that connects Pope Francis and Cardinal Tobin, just as they share a vision of the Church that is open and welcoming, just as they are both advocates for immigrants and refugees, just as they both have a natural humility about their own lives and an understanding sense of humanity toward the lives of other people.